Join us for Homecoming and Family Weekend 2018! Eastern Mennonite University’s Homecoming and Family Weekend 2018 offers everything from athletics events to music and theater performances, receptions, class reunions and more. Events are Friday, Oct. 12, through Sunday, Oct. 14. At a luncheon, the Jubilee alumni program – alumni who attended EMU 50 or more years ago – inducts the class of 1968. The Margaret Martin Gehman Gallery features an art exhibit by five 2016 graduates: Jonathan Bush, Scott Eyre, Caleb Schlabach, Stephanie Toth and Londen Wheeler. EMU field hockey takes on St. Mary’s on the turf field in the evening. The day ends with an alumni music celebration featuring the Bubble Sisters and the EMU Jazz Ensemble, hymn singing and performances by four a cappella groups that include alumni or current students: Cantore, Shekinah, Striking Accord and EMU’s Emulate Choral Ensemble. The Haverim breakfast and program features John Tyson ‘09, a pastor at Des Moines Mennonite church. Current students and business alumni meet-and-greet during a career connections networking event. A homecoming celebration in Lehman Auditorium provides opportunity to celebrate alumni award recipients, take class photos (professional photo for classes celebrating 10, 25, and 50 years), and enjoy seeing old friends. Class reunions and lunches are for grad years ending in 3 and 8, and, in the Royals’ Den, for parents. Affinity group gatherings include Black Student Union, Honors alumni, Ireland cross-cultural, various athletic teams, Martin and Lehman houses and more. A Cords of Distinction alumni reception is also scheduled. EMUTenTalks: Impact. Influence. Inspire returns this year to the MainStage Theater with dynamic 10-minute presentations by professors Judy Mullet, David Evans and David Brubaker. The Peace, Love and Little Donut Run blends three compatible passions – running, t-shirts and donuts – on a two-mile course for all ages. 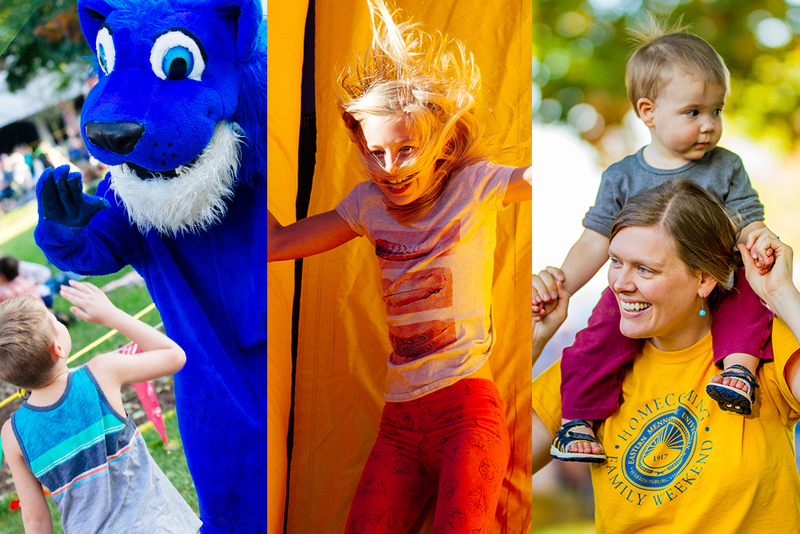 The afternoon fall festival features the Walking Roots Band, tailgating, local food trucks, a Li’l Royals’ Zone for children, and an alumni and parent reception tent. Women’s volleyball takes on Ferrum. Women’s soccer takes on Roanoke, with men’s soccer competing against Lynchburg. The Homecoming worship service includes Alumni Awards recipients Claudette Monroy ‘10, Regina Horst ‘85 Chacha and Gilberto Perez, Jr. ‘94, GC ‘99 speaking about their callings. October 12-14 is EMU’s Homecoming!